Mike White began his career at Amersham International (1985 - 1995) in the areas of molecular biology products and technologies for studies of gene function. While working at Amersham, he was awarded a PhD from Imperial College London. During this period he pioneered the use of the firefly luciferase gene as a reporter, particularly for non-invasive imaging in mammalian cells. In 1995, he was appointed to a lectureship at Liverpool University and to Professor at the beginning of 2004. At Liverpool, he founded the Centre for Cell Imaging (CCI), a suite of microscopy and imaging equipment, specifically designed for the non-invasive imaging of cellular processes. 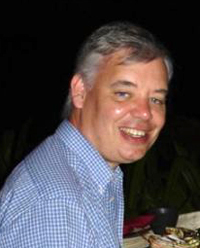 In 2010 Mike moved to Manchester University and established the Systems Microscopy Centre. The SMC incorporates state-of-the-art equipment for multi-photon and confocal microscopy plus high throughput luminescence and fluorescence imaging. The major overall interest of White's group is to understand the relationship between signalling dynamics in specifying transcriptional control and cell fate. In addition to his research activity, Mike has extensive collaborations with industry (e.g. Hamamatsu & Zeiss) & has played a role in developing tools for public engagement science. In 2006 he led a multidisciplinary group that presented at the Royal Society Summer & Glasgow exhibitions & at Science Day at Buckingham Palace.